Who needs a super fast and easy, last minute party favor? 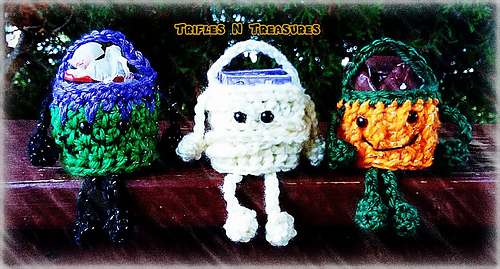 The Mini Monster Baskets are here to save the day! There’s plenty of time left to whip these cuties up for class parties, or those special trick-or-treaters They may be tiny, but they bring HUGE smiles! 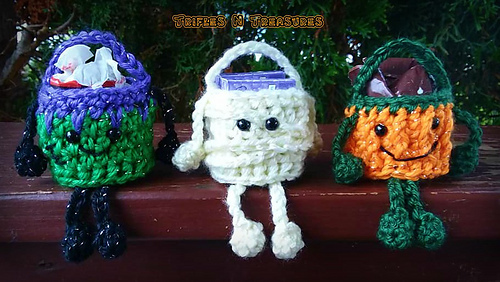 You get full instructions for the Frankenstein, Mummy, and Pumpkin Each finished basket model measures 1.5” x 1.5”…just big enough for a little sweet treat, but you can easily adjust the finished size, by using different sized yarn and hooks!